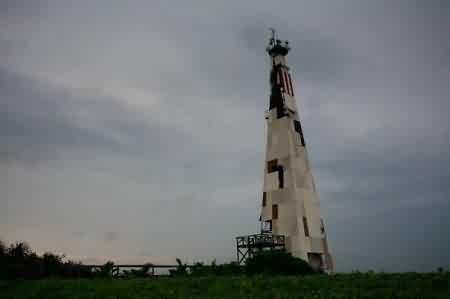 The lighthouse is still standing upright on Beras Basah(eng: wet rice) Island. Soft sandy beaches are still fascinating with crystal-clear water. Any photography enthusiasts would regard it as an inviting target scene. But will it last forever? Beras Basah Island, also known as Sand Island, listed as one of the well-known tourist destination in Bontang, East Kalimantan, Indonesia. Since the distance is less than an hour away by speed boat, the small elegant island was chosen as the main recreation place by the employees of PT Badak LNG (a big gas company in Indonesia). Visitors from outside Kalimantan can take Balikpapan flight path which is generally crowded. From Balikpapan, visitors take a bus to the Bontang. The fare is Rp. 85.000(USD $8.5) for about five hours travel time. While if from Samarinda, the journey is only about 2 hours by bus costs Rp.20.000 or USD $2. Arrive in Bontang, visitors can directly go Tanjung Laut Port. It’s not difficult to find a ship that will take us to Sand island from there. Rental rate for boat is USD $ 30 to US $40. One boat can carry 10 passengers. It only needs 40 minutes from the port to Sand island. Remember, don’t forget to bring your own food supplies. Because we will not find any food or beverage stalls on the Sand island. There is no lodging either. The visitors usually doesn’t stay. They come to enjoy the soft white sand, clear sea water glistening like a crystal, or a 15 meter lighthouse that stands there. For the photography hobbyist, the lighthouse that stood in solitude is always the favourite object. Sand island located on Makassar strait. It’s a quite strategic location between the area of PT Badak LNG refineries and Segajah island that appears when the sea receded and disappeared on the sea tide. 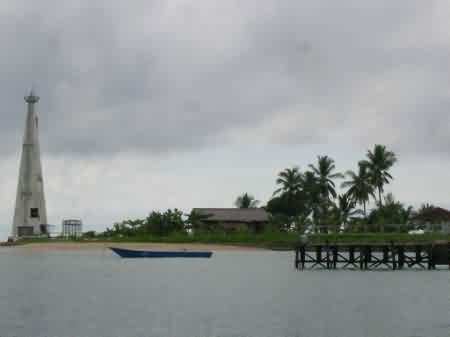 Sand island is about seven kilometers south of Bontang with Makassar surround it. Far enough to enjoy privacy, but not far enough to feel isolated. The island is a perfect location for those wanting to escape from their daily routine. According to the story of local people, the name ‘Beras Basah’ or wet rice appeared when a large vessel carrying rice from Sulawesi hit by big waves. Worried about the ship’s sinking, the crew discharge the rice on the island and become wet. The name ‘Beras Basah’ was used by people since then. It is unclear whether there is settlement on the island. Clearly, the current Sand island is inhabited only by one family of fisherman. The visitors also are not busy as before. The island was visited by local and foreign tourists in 1990s. But since 2000, the island seems more and more forgotten. It’s a shame, since the island has million of natural potentials worth developed into tourist mainstay. Unfortunately, it seems that the pretty island got no attention from the city government. Rather than build new facilities, the existing lighthouse is unkempt. What’s even more alarming is, Sand island area continues to shrink due to abrasion. Two or three years ago, the island is estimated to have 1.5 acres. Today, it’s probably only 1 acre. Eroded inch by inch, disappeared into the waves.